The At Home Personal Care Services team is dedicated to the idea that seniors should have the chance to live as independently as possible, for as long as possible, in their own homes, and doing the things they like to do. Aging can be a hard process, however, with various medical problems and mobility difficulties—but that is exactly where we can help. Our highly-skilled team of nurses, home health aides and physical therapists, occupational therapists and speech therapists provide the highest-quality skilled senior home care in Northern Virginia. Our team is able to help decrease accidents, prevent trips to the hospital and enable seniors to live as full a life as possible, at home. Our wonderful nurses are able to take care of a host of medical care needs at home that your loved one might otherwise have to have done in an institutional setting. 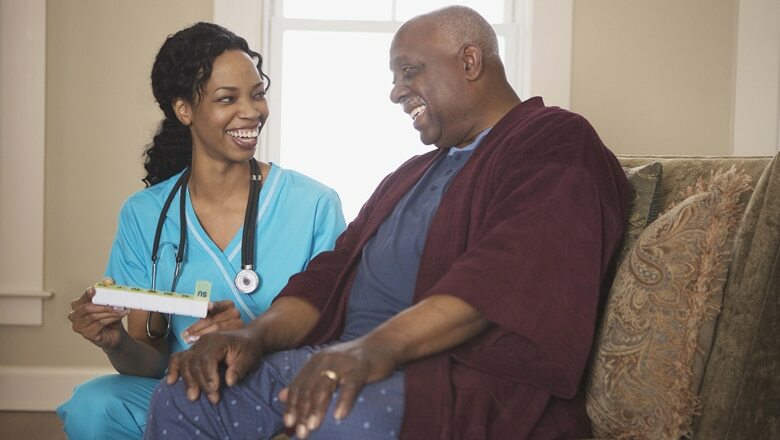 One of our qualified nurses will provide a complete in home Health Assessment. The nurse will develop a Plan of Care, approved by the Physician. The nurse will teach how to administer medications perform ostomy care. Things like administering medications, colostomy care, catheter care, and other procedures necessary for the patient in home. This saves your loved one the expense and stress of a hospital setting during recovery from an illness or during a long-term care situation. Our amazing nurses are a crucial part of our skilled senior home care team, and they make your loved one’s life at home safe, comfortable and therapeutic. Together with our nurses, home health aides strive to make your loved one’s life at home safer and more comfortable each day. They ensure that your loved one is able to move about safely and help them eat, bathe and dress, and perform light housekeeping, errands, shopping. They can also be your eyes and ears when you are not able to be there, so that any changes in their health needs can be caught and addressed quickly. Besides being able to stay at home where they feel comfortable, being able to live as independently as possible is one of your loved one’s top desires. In many cases, an illness, injury or the effects of aging can hamper this independence—at least until one of our physical therapists comes to help! Our physical therapists help senior and children with rehabilitative services to help improve range of motion, strength. Physical therapists will assist your loved one to remain in the home safely and comfortably. Our occupational therapists help senior and children with rehabilitative services to help improve range of motion, strength. Occupational therapists will assist your loved one to remain in the home safely and comfortably. Our skilled senior home care team is here to help. To learn more, please call us today at (703) 330-2323. We look forward to hearing from you!